The Droll Yankees Jagunda Squirrel Proof Bird Feeder offers a level of quality, design, versatility, and ease of use unlike any other feeder. This colossal feeder features a unique squirrel proof design that will keep squirrels frustrated. 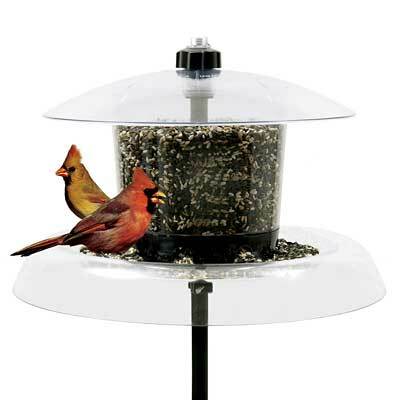 The expansive 18.5" clear polycarbonate feeder tray doubles as a pole-mounted squirrel baffle to discourage squirrels from reaching the seed. The clear polycarbonate feeder reservoir has a large 6 quart capacity. An innovative internal baffle design ensures that the feeder empties completely from the eight feeder ports to prevent seed from collecting and spoiling. The 15" clear polycarbonate feeder cover shelters birds while protecting seed from the weather. Drainage holes in the tray prevent water from collecting, and the included Collet fastener fits on top of the weather dome, preventing it from flying off in high winds. Droll Yankees Collet Technology makes cleaning and filling the Jagunda a breeze. Simply loosen the Collet fastener and lift the feeder roof for quick and easy access. The Jagunda mounts easily on the included 5.5' black steel pole. Attract a wider variety of birds or create different feeding zones by installing a tube feeder above your Jagunda. Use the included 17.5" long pole auger to keep your pole mounted securely in the ground. A 3/4" Threaded Pole Adapter is also included for mounting a tube feeder on the top of the pole in addition to the Jagunda. Lifetime warranty against squirrel damage. Black Oil Sunflower Seed, 50 lbs. Wild Bird Seed Mix, Deluxe Blend with Fruit, 50 lbs. Raw Peanut Splits, 50 lbs.